This blog focuses only on the technical details of using the external procurement catalog ARIBA in FIORI (ECC) and not on Create PR. For procurement, the user launches the external catalog (punch out), selects the items and return from the catalog using OCI (Open Catalog Interface). There are many blogs explaining the OCI concepts so we will not go deep in this. In simple words, the OCI interface is a simple protocol that launches a supplier catalog using a simple HTTP get or post command, also the return from the catalog is a simple post back. Let’s understand the process flow first. The HTTP POST call structure is maintained in SPRO. For Purchase Requisition, the path is SPRO->Materials Management->Purchasing->Environment Data->Web Services: ID and Description. These parameters are read with their respective values maintained in SPRO (fixed or runtime) and a simple HTML form POST is done. This calls the ARIBA catalog. Here the most important part is the HOOK_URL, this will contain the path where the catalog must return with the response items. Technically, in ECC WSI_CALL is the FM that is used to call the external catalog by specifying the web service id and the HOOK_URL. WSI_CALL internally calls WSI_CUSTOMIZING_READ to read the SPRO call structure. After the catalog is launched and the shopping cart is created, after checkout the cart items are returned back using OCI. UI5 does not have the capability to read this. So the approach used is to redirect the catalog to a BSP application (HOOK_URL) that reads the request form fields and return this to FIORI. In simple HTTP post the BSP application URL is specified. This BSP application is developed on Gateway server. The approach used is to read the HTTP form data in BSP on Gateway and use the same standard FM’s to map that data by using a custom RFC FM developed on ECC. FM is developed in ECC as all the standard OCI FMs are available on ECC and not on gateway. In OnInitialization Event of BSP , the form data is read using the below code. LOOP AT gt_myattr INTO DATA(lwa_attr). CONCATENATE lv_string lwa_attr-name lc_equal lwa_attr-value lc_ampersand INTO lv_string. 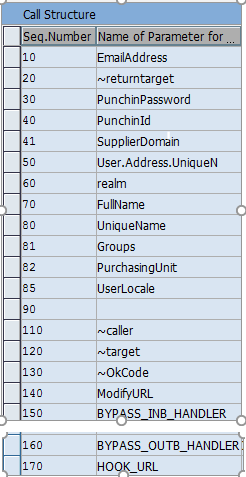 This internal table gt_myattr contains all the shopping cart items in name value pair. This table is then converted into a string of above format as expected in standard FM. Data : lt_str             TYPE TABLE OF swastrtab. DATA : cnht_post_data_tab TYPE TABLE OF cnht_post_data_line. LOOP AT lt_str INTO DATA(ls_str). DATA : ltr_fields TYPE TABLE OF savwctxt. LOOP AT ltr_fields ASSIGNING FIELD-SYMBOL(<lwa_fields>). TRANSLATE <lwa_fields>-fieldname TO UPPER CASE. LOOP AT ltr_fields INTO DATA(ls_fields). lc_html_equ IN ls_fields-fieldcont WITH lc_equal IN CHARACTER MODE. LOOP AT lt_items INTO DATA(lwa_items). LOOP AT lt_text INTO DATA(lwa_text) WHERE line = lwa_items-line. CONCATENATE lwa_pritems-itemtext lwa_text-text_line INTO lwa_pritems-       itemtext SEPARATED BY space. CALL TRANSFORMATION id SOURCE = lt_pritems RESULT XML lo_json_writer. ex_json = cl_abap_codepage=>convert_from( lo_json_writer->get_output( ) ). text     = "<%= gv_json_c %>"
This completes the cycle of calling the external catalog from FIORI, creating shopping cart and returning the items back to FIORI app from the Odata side.